Kristin is the founder of Urban Yoga Center. She and her loyal following of teachers and students to celebrates 11 years in 2012. UYC offers 30 classes a week of Hatha Yoga All Levels, varied styles, and hosts every major Kirtan artist on International tour. UYC also features workshops with visiting yoga teachers, medical doctors, and spiritual seekers. Students range in age from 9 to 96, and there is the dedicated ?Teen Yoga for P.E. Credit Program? in conjunction with Palm Springs Unified School District. (PSUSD). For many years Kristin and UYC have been associated with the Desert AIDS Project, AIDS Assistance Program, and 100 Women. UYC students and the Teens are the focal point for the Desert AIDS Walk, doing an Urban Yoga Warrior Team warm-up onstage involving all several thousand participants. Kristin and UYC have also been an integral part of the Bhakti Fest fabric since its inception. UYC is host to many superb Pre Bhakti Fest Parties, kirtans, performances and other events. 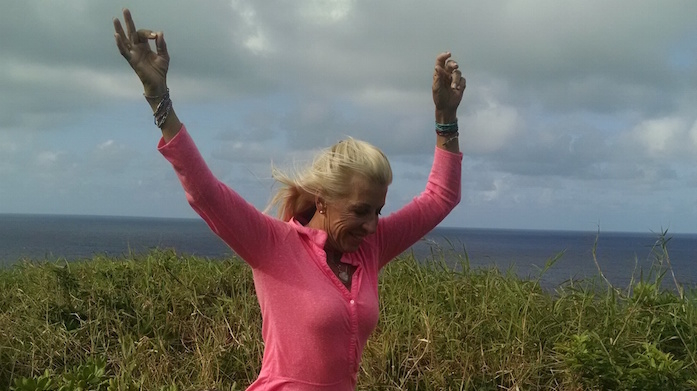 Kristin cherishes the opportunities to teach Heaven Bound Heart Urban Yoga. She loves to weave her experiences and her teachings of the past 36 years, to be an inspiration and companion in the dance of sung prayers, yoga asanas, community gathering, breathing together at Bhakti Fest. Kristin?s first yoga teachers were Indra Devi, Dr. Anne Marie Bennstrom and Catharina Hedberg. Urban Yoga is sporty, humorous, spiritual, and loving. Kristin Olson’s Urban Yoga Center Welcomes You to a happy healthy holy experience. Drop In anytime! Kristin Loves All!